Thanks to your feedback, Swimia has grow to be in just various months one probably the most vital internet sites of swimming pools. Here you may have all of the info we know about ARRIBA Erlebnisbad, in Garstedter Feld. 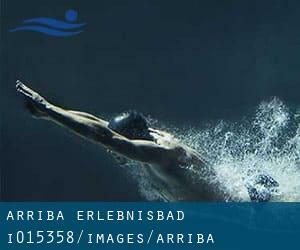 Don't forget you can also promote this pool so ARRIBA Erlebnisbad will appear the first of Garstedter Feld, or perhaps the very first of your country, get in touch with us to know alot more. Swimmers like you reported 25 meters, 6 lanes, Indoors. Phone number and e-mail address are number for this Swimming Pool. Write down the GPS coordinates we have on our file for this Pool, so you can enter them into your GPS to enable you locate the Aquatic Center easily. If you believe that any of the information is incorrect, please make contact with us. Enable us be better day-by-day. Updated on 2019 Olshausenstraße 74 , Kiel , GERMANY (Postal Code: 24098). Among all the activities offered by the center, when you are keen on swimming you will enjoy Olympic size, 6 lanes, Indoors. If you need to contact this Swimming Pool, email address and phone number are both number. Updated on 2019 Hansaring 177 , Neumuenster , GERMANY (Postal Code: 24534). This sports center provides 25 meters, 5 lanes, Indoors. Contact facts for this Swimming Pool such as phone number and email address are number. Updated on 2019 Johannesstraße 8 , Kiel , GERMANY (Postal Code: 24143). This sports center offers 25 meters, 6 lanes, 1.3 meters - 1.9 meters depth, 1.3 meters - 1.9 meters depth, Indoors. For this Swimming Pool, only phone number is number here. Updated on 2019 An der Untereider , Rendsburg , GERMANY. Swimmers like you reported 25 meters, Indoors. Unfortunately we do not have the e-mail address of this Swimming Pool, but we can provide you with the phone number. Updated on 2019 Friedrich-Ebert-Straße 1 , Schleswig , GERMANY (Postal Code: 24837). Swimmers like you reported 25 meters x 12.5 meters, 5 lanes, Indoors. Unfortunately we do not have the email address of this Pool, but we can give you the phone number. Updated on 2019 Olympiazentrum , Drachenbahn 18 , Schilksee , Kiel , GERMANY (Postal Code: 24159). This sports center offers 25 meters, 5 lanes, 2.3 meters - 4 meters depth, 2.3 meters - 4 meters depth, Salt Water, Indoors. For this Swimming Pool, only phone number is number here. Updated on 2019 Sterleyer Straße 44 , Moelln , GERMANY (Postal Code: 23879). Among all of the activities offered by the center, if you are keen on swimming you can expect to enjoy 25 meters, 5 lanes, 0.8 meters - 2.2 meters depth, 0.8 meters - 2.2 meters depth, Indoors. Just in case you want to contact this Swimming Pool before dropping by, we only know the phone number. Updated on 2019 Ludwig-Jahn-Strasse 7 , Bad Schwartau , GERMANY (Postal Code: 23611). Swimmers like you reported 25 meters, Indoors. Phone number and email address are number for this Pool. Updated on 2019 Wilhelmstraße , Marne , GERMANY. Among all the activities offered by the center, if you are considering swimming you might take pleasure in 25 meters, 5 lanes, Indoors. Just in case you want to make contact with this Pool before dropping by, we only know the phone number. Updated on 2019 Am Schulzentrum 4 , Wilster , GERMANY (Postal Code: 25554). This sports center delivers 25 meters x 12.5 meters, 5 lanes, 1.8 meters depth, 1.8 meters depth, Indoors. For this Pool, only phone number is number here. Updated on 2019 Rudolf-Breitscheid-Straße 40 , Wedel , GERMANY (Postal Code: 22880). This sports center gives 25 meters, Indoors. Contact information for this Swimming Pool for instance phone number and e-mail address are number. Updated on 2019 Eutiner Straße 45 , Bad Malente - Gremsmuehlen , GERMANY. Swimmers like you reported 25 meters, Indoors. Phone number and e-mail address are number for this Pool. Updated on 2019 Barbarastraße 7 , Kappeln , GERMANY (Postal Code: 24376). Among all the activities provided by the center, for anyone who is thinking about swimming you can enjoy 25 meters, 5 lanes, 1.1 meters - 4 meters depth, 1.1 meters - 4 meters depth, Indoors. If you'll want to make contact with this Swimming Pool, email address and phone number are both number.